Cast your minds back to 1982 and you might remember a power-pop quintet called Tommy Tutone. They had a big hit called 867-5309/Jenny. 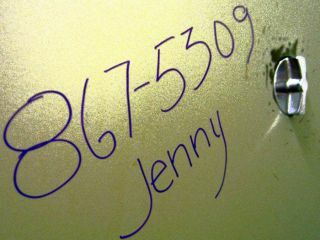 As in "call Jenny on 867-5309 for a good time". Now, you can own a part of 80's pop history. 867-5309 is for sale on eBay. In 1982, comedians the world over prank called the number and asked for Jenny all the time. There were several 867-5309s across the US - most states had one with a different area code. In particular, New York's lucky recipient caused quite a stir, according to frontman Tommy Heath: "We had people threatening to sue us. It was the Buffalo Chief of Police's daughter's number in New York." This particular version is, according to its owner Spencer Potter "one of the last remaining in service." You might think that the 8000-10,000 calls it still receives every year would put buyers off. At the time of writing, however, it's going for a staggering $400,100.